Two Chicks On Books: Blog Tour- ANOMALY by K.A. Tucker Excerpt and a Giveaway! 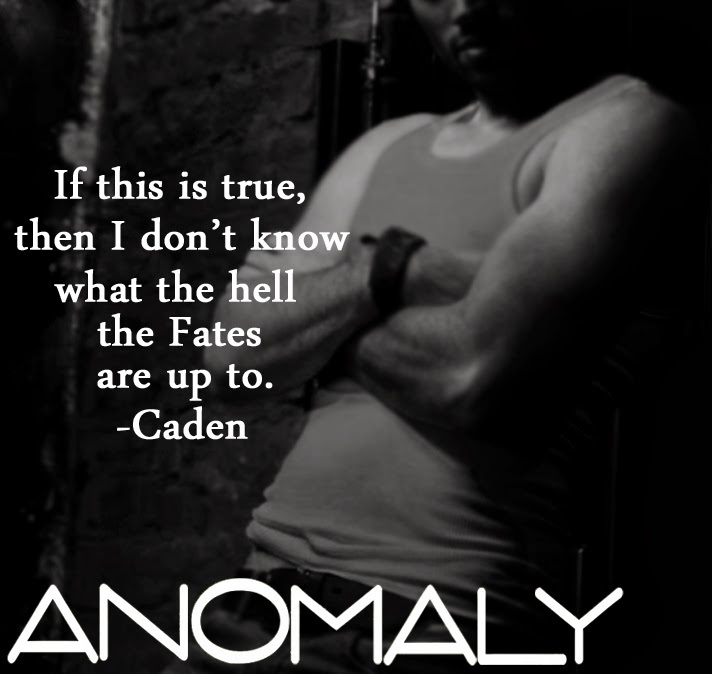 Blog Tour- ANOMALY by K.A. Tucker Excerpt and a Giveaway! K.A. Tucker's ANOMALY, the fourth and final book in her Young Adult Paranormal Series, The Causal Enchantments, is out! We're celebrating with a blog tour to help give you everything you need to know about this fantastic series. The Causal Enchantments will keep you on the edge of your seat while you read through all of the twists and turns. You don't want to miss this tour! See the schedule below and then enter to win a complete set of signed copies in the International giveaway! Check out this awesome excerpt! A flurry of harsh words and threatening tones swirled from the tunnel as we trailed Sofie back into the mine, the entrance a forty-five degree slant with a low overhang. There were no lights, no fires—nothing to illuminate the cavernous space—and yet with this new eyesight, I could easily distinguish every form, every face, every scowl. As usual, Mortimer’s was the most ominous. “We need to stop this now!” His demand ricocheted off the chiseled stone walls. “She’s overreacting,” Galen said with a sideways glare toward Mage. My eyes widened. They’re considering nuclear warfare already? Not even forty-eight hours had passed since the slaughter at Viggo and Mortimer’s Fifth Avenue building! “We have never been friends,” Mortimer spat back, but then paused to dip his head, tempering his manner in the act. “But I agree. He must be stopped.” I could only guess that they were talking about Viggo. “What has he done now?” Caden called out. Several heads turned to regard us. “You mean besides rampant murder and pillaging?” Galen answered. I already knew about that. Unfortunately. Apparently, Viggo hadn’t wasted any time. Soon after he learned of Veronique’s release from the statue and that she had chosen Mortimer, he left a trail of bodies throughout Manhattan, terrorizing the city. News reports talked of a Christmas serial killer. “Two hours ago, he walked into a press conference with national coverage and murdered the city’s mayor on live television,” Sofie explained. Caden pulled me against him as voices rose again, clamoring to be heard. Lilly’s rancorous council member, Kait, screamed something about being trigger happy; Mortimer bellowed about being naïve fools. Even little Lilly, who normally remained composed, counted issues on her fingers. Only Mage and Sofie stood silent, watching the fury unfold. “I thought they had a plan in place,” I whispered to Caden. And yet we already seem to be at war, Max grumbled from his place beside me. She was merely a pawn in their game. And then something happened. Once the fragile, naïve human, Evangeline has become altogether … different. A being who holds formidable power, she may be the key to changing the course of fate. Or she could be the final nail in the world’s coffin. But Evangeline doesn’t know exactly what she is, what she can do. She knows only that she has to stop an enemy far worse than the Sentinel and the sorceresses—one driven by revenge. And he’s hunting the man she loves. As Evangeline fights to keep Caden alive and the human population from eradication, she can’t help but sense the imminent doom. Find out if fate will prevail in the harrowing conclusion to the Causal Enchantment series.